^ Helene S (2010). "EU Compassionate Use Programmes (CUPs): Regulatory Framework and Points to Consider before CUP Implementation". Pharm Med. 24 (4): 223–229. doi:10.1007/BF03256820. Archived from the original on 7 July 2012. ^ Brennan Z (5 June 2013). "CROs Slowly Shifting to Adaptive Clinical Trial Designs". Outsourcing-pharma.com. Retrieved 5 January 2014. ^ "Adaptive Clinical Trials for Overcoming Research Challenges". News-medical.net. 17 September 2013. Retrieved 4 January 2014. ^ Young, Susan. "Foundation Medicine Joins Coalition Aiming to Shake Up Cancer Drug Trials | MIT Technology Review". Technologyreview.com. Retrieved 14 November 2013. ^ "Frequently Asked Questions | University of Arizona Cancer Center". Azcc.arizona.edu. Retrieved 14 November 2013. ^ "BIO to Use ViS Analytics to Streamline Pediatric Clinical Research - WSJ.com". Online.wsj.com. 7 May 2013. Archived from the original on 4 February 2014. Retrieved 14 November 2013. ^ "Rise in Scientific Journal Retractions Prompts Calls for Reform". The New York Times. 16 April 2012. Retrieved 22 May 2018. ^ "Development & Approval Process (Drugs)". U.S. Food and Drug Administration. Retrieved 22 May 2018. ^ "Investigational New Drug (IND) Application - Final Rule: Investigational New Drug Safety Reporting Requirements for Human Drug and Biological Products and Safety Reporting Requirements for Bioavailability and Bioequivalence Studies in Humans". www.fda.gov. Center for Drug Evaluation and Research. 29 September 2010. Retrieved 11 November 2017. 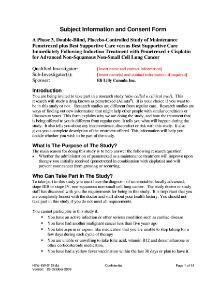 ^ "Parkinson's Disease Clinical Trials". Fox Trial Finder. Retrieved 14 November 2013.